Weston McKennie gets to play to his strengths for U.S. In his second full season with Bundesliga giant Schalke 04, 20-year-old Weston McKennie has experienced extreme highs and lows. He has scored for Schalke 04 in the UEFA Champions League and helped it reach the round of 16. He has played, as he says, "any and everywhere" for Schalke 04 and taken on greater responsibilities. But it has struggled to find success in the Bundesliga. Things got so bad that head coach Domenico Tedesco was recently fired and been replaced by Dutchman Huub Stevens. Change is what the young Texan has also experienced on the U.S. national team since he arrived in the aftermath of its elimination from the 2018 World Cup, Dave Sarachan gave McKennie his first call-up in November 2017 when he scored in the 1-1 tie with Portugal, but Gregg Berhalter has taken over as the national team coach. "Change is always different," he said. "And maybe a good thing also. I am going through that situation now at my club. It's weird. But it's something as a player you're going to have happen in your career. It's just about how you adapt to it. I think it is a good change for the national team. Before we had a little bit more free time. With Gregg, it is a little bit different. We have a structure. We have a set idea. We have a game plan in what we want to do. Since this is our first camp, all of us together, we're trying to get on the same page." Berhalter visited with his European-based players this winter and explained to them how he sees the team's new style of play and how he sees their role in the team. "He went over style of play and how he wants us to play and what possible roles I could be playing," explained McKennie. "Knowing we're going to be coming into camp and we were going to be a whole month behind [what the players in January camp learned], he was just trying to refresh us and give us an idea of how he wants us to play. He makes sure that each and every player, whether it's in Europe or South America or in the MLS, they are all connected. Whether that's sending videos through email so we can maybe get a look at it before we come into camp. Or it might be a phone call or coming out to connect with you personally." McKennie said he is open to Berhalter's ideas and methods. "I think it is a good idea to inform players before they come into camp," he said, "so they know what their role is and what the purpose of the camp is and maybe get to know the opponent before you even come to camp, so you get an idea and are a step ahead before you come." McKennie says he liked what he heard from Berhalter about his role: "Mainly the 10 role, maybe playing defensively as an 8. I'm comfortable with that. Obviously, you see with my club team, I play kind of any and everywhere. Anywhere he sees me on the field I think I would be comfortable with but obviously in midfield is best for me." McKennie says he is favorite position is as a box-to-box midfielder but he likes the idea of being used in the Berhalter's U.S. attack. "I think a lot of players would love to be in the attack and be able to get in goal-scoring opportunities and score goals," he said. "With him saying I can play in that 10 role and get up the field and create plays and maybe score goals also is definitely very appealing. I think I feel comfortable with it, too. I think one of my strengths with the position is to create plays and get in the box and make stuff happen. Defensively, I see someone that works and breaks up plays." McKennie says his role changed from his first full season with Schalke's first team after Leon Goretzka, its best midfielder, moved to Bayern Munich. At first, he was the destroyer, winning balls and getting them to Schalke's attackers. "My job was more to break up plays and get them the ball so they could create the attack," he said. "Now with Leon gone, I had to take a little bit more of a role into that position. We haven't had the best season so I think anything helps. I think I just got a little bit lucky in being put into that position and being given that responsibility. I think I've done pretty good with it so far. But obviously, the team's success is the most important, and it has not been going our way right now." Schalke has lost its last six games in all competitions by a margin of 22-4, dropping to 15th place in the Bundesliga and exiting the Champions League to Manchester City, 10-2, on aggregate in the round of 16. In Schalke's first game since Stevens took charge, it lost to RB Leipzig, 1-0. 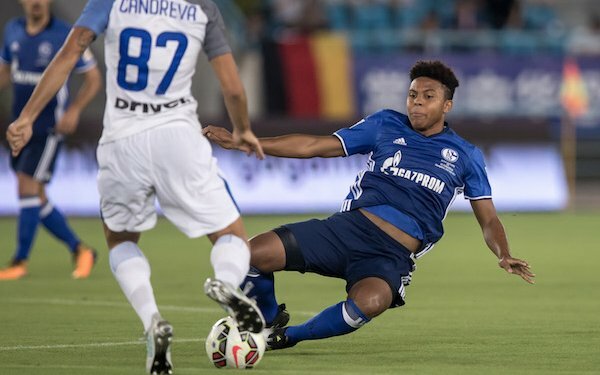 The game was McKennie's first Bundesliga meeting with U.S. teammate Tyler Adams, the young Leipzig star. The irony wasn't lost on them that McKennie played at right back while Adams played in midfield. "The last time we played against each other was A-team [vs.] B-team in U-17 residency," said McKennie, adding he was always on the B-team. "I wish I could have played midfield that game one-on-one against him. I think it was pretty funny we kind of switched roles. I played right back in that game. He played midfield and coming into the national team he might have to play right back and I get to play midfield. After the game, we laughed and joked about it. He stayed the night at my house and we flew here together." Berhalter said he doesn't want to lose McKennie's attacking qualities by sticking him at right back. "We've been analyzing the games and looking at their individual qualities and we think Tyler is better suited," he said when asked about the roles on Wednesday. "What I like about Weston -- and I'm not sure how much he has shown it in the last couple of games -- is he's got very good finishing momentum, he comes into the penalty box with a lot of speed and a lot of momentum and he can score goals that way. And I think if we play him at right back we might potentially lose that." Like other players, Berhalter says he wants to take advantage of McKennie's skill-set. "To play him as a 10, he can really make those runs behind the backline," he said. "If you saw the first Man City game when he didn't play right back, he was a winger and constantly threatening the backline, he was constantly trying to get into the penalty box, he was very dangerous with his vertical running. And I think in the position we will have him play, we can take advantage of that." 6 comments about "Weston McKennie gets to play to his strengths for U.S.". Bob Ashpole, March 20, 2019 at 10:29 p.m. I looking forward to seeing the "style of play". The talk about style of play is confusing. Who picks a number 10 for his "vertical running"? Seeing is much better. Wooden Ships replied, March 21, 2019 at 8:53 a.m.
thinking the system/style must be groundbreakingly sophisticated. It is important for the players to have an idea on what the managers expects, but to also have the players with the skill and awareness to adapt during a match. Aside from the qualities needed on the ball will the individual players have the imagination and freedom to go off script. Good luck tonight fellas. Nick Valenti, March 21, 2019 at 11:43 a.m. I'm seeing him (as Berhalter explains) playing like Raheem Sterling. More slashing through the D by dribblind or passing to get it right back through open channels. Not sure how it will play out but I look forward to seeing it tonight! beautiful game, March 21, 2019 at 12:44 p.m. Team system and tactics are fine-tuned planning concepts based on player adaptation and quality. It would behoove coach B to experiment with a 5-man attacking system and see if it works in the early stages of shaping some kind of style of play. Wooden Ships replied, March 21, 2019 at 1:28 p.m.
Bg, I’d expect a 7 man attacking approach. Bob Ashpole replied, March 21, 2019 at 4:39 p.m. Except that management has reportedly imposed a style of play which the GM enforces. The coach is not supposed to have any say in the style of play.